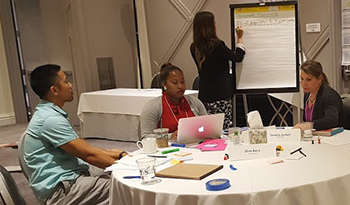 The StriveTogether Expert Convening in Las Vegas this past June was a learning community of people practicing collective impact, all helping each other learn and grow. Guest post by Victor Cedeño, director of networks and education policy with Generation Next, a cradle-to-career partnership in Minnesota. This past June, I had the opportunity to attend the StriveTogether Expert Convening in Las Vegas. I was honored to be invited but was even more excited for the opportunity to learn from other communities. As it turns out, the title “Expert Convening” was somewhat ironic. These are just some of the questions and conversations we had in big and small groups and it made me realize that despite our best efforts to follow the StriveTogether framework, we are all still learning the best way to do collective impact. The work of improving educational outcome for children, given the various challenges in our communities, is inherently difficult. Doing that work as part of a collective impact partnership is inherently complex. We have to juggle many interests, prioritize between all important issues and galvanize others into action. We consider ourselves responsible for outcomes we mostly don’t even impact directly as partnership staff. Framework or not, there is no perfect blueprint for each our communities. This is why I found the term “Expert Convening” to be ironic. Although many now consider themselves experts in the field of collective impact, the truth is that each community is its own unique subject. That feeling of ambiguity you feel is real and I bet most of us feel that way doing this work. That is why gatherings such as the one in June and the one next month in Tennessee are so critical. The most useful resource for collective impact partnership staff is not a book, a framework or an expert somewhere. It is others, like us, who are struggling in similar roles, who may have tried similar strategies in the past and what any outcomes may have taught us. My colleague from another city, Juliette Price, has already captured our learnings from June in an excellent blog, but no blog can do justice to the transfer of knowledge that happens in person or over the phone. Without connecting to others from Seattle, Dallas, Albany, Tacoma and other cities, we could not have made the progress we have here in Minneapolis-St. Paul. I’m looking forward for more opportunities to connect next month in Tennessee, and if we balance our expertise in our fields and communities with a desire to learn from each other, I know that it will be a productive gathering. Victor Cedeño is the director of networks and education policy with Generation Next, a cradle-to-career partnership in Minneapolis and St. Paul, Minn. Victor serves as the primary staff for identifying education policy innovations locally and across the country, and ensures these innovations are core parts of Generation Next strategies. He is also tasked with ensuring that Generation Next networks are supported, aligned and working strategically to find and identify the most effective solutions to meet the coalition’s five key goals to close the achievement gap.